LOCATION.--Lat 39`56'46", long 76`45'20", York County, Hydrologic Unit 02050306, on left bank 0.5 mi upstream from bridge on Richland Avenue (SR 3054), 2.0 mi downstream from South Branch Codorus Creek, and 2.0 mi southwest of York. PERIOD OF RECORD.--August 1940 to current year. October 1915 to August 1923, and August 1926 to September 1932 (gage heights and discharge measurements only), in reports of Pennsylvania Department of Forests and Waters. Published as "at York" 1915-32. GAGE.--Water-stage recorder and crest-stage gage. Datum of gage is 356.39 ft above National Geodetic Vertical Datum of 1929 (U.S. Army Corps of Engineers bench mark). 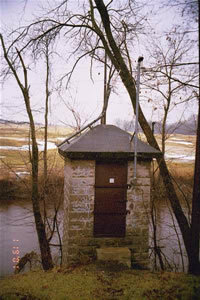 Prior to Sept. 30, 1932, non-recording gage at site 1.6 mi downstream at different datum. Satellite and landline telemetry at station. COOPERATION.--Records of diversion provided by York Water Co. from 1940 to 1996. Funding for the operation of this station is provided by the U.S. Army Corps of Engineers, Baltimore District. REMARKS.--Daily discharge not available Oct 1997 - Sept 2018. Supplied by USGS: Maximum recordable gage height (stage sensor operational limit) - 24.5 ft; Data transmitter operational limit - 25.4 ft.